A short tale about the 2016 Florida Paddlers’ Rendezvous in Flamingo! 2016 Florida Paddlers’ Rendezvous in Flamingo, Everglades National Park. The Florida Paddlers’ Rendezvous go back as far as the 1980’s when paddle clubs from around the state would have informal get togethers. Today, it is a multi day paddling and camping event, each year hosted by a different local club in a beautiful area. This year’s rendezvous was hosted by Charlie Arazoza of www.bushpaddlers.org and held at the Flamingo Campground at the “end of the road” on December 2-4, 2016. Some of the sponsors included the Florida Paddling Trails Association (FPTA), and the event was set to benefit the South Florida National Parks Trust. There were many guided scheduled paddles, camping activities and social gatherings throughout the long weekend. I was able to participate for two days and one night, and co-lead two trips on the Bear Lake Canoe Trail and on Florida Bay! Welcome to the 2016 Florida Paddlers’ Rendezvous in Flamingo, Florida – at the end of the road inside Everglades National Park! Who would’ve thunk it that the 2016 Florida Paddlers’ Rendezvous would be held at the same time and same place as the 2016 Florida Mosquitoes’ Rendezvous! Suited up, en-route to the launch spot for the Bear Lake Canoe Trail. Bear Lake Road is a narrow dirt track leading up to the old Homestead Canal launch. I could see swarms of more mosquitoes outside the windows! Note that the gate to access this road is often locked. You will need to call the Ranger station and inquire ahead of time if you want to launch there! There were many guided Everglades paddles during the Rendezvous. Some of the trails and paths used were pioneered and mapped by contemporary backcountry explorers Keith W. and Terry Helmers, among others at the Everglades Exploration Network (EEN). 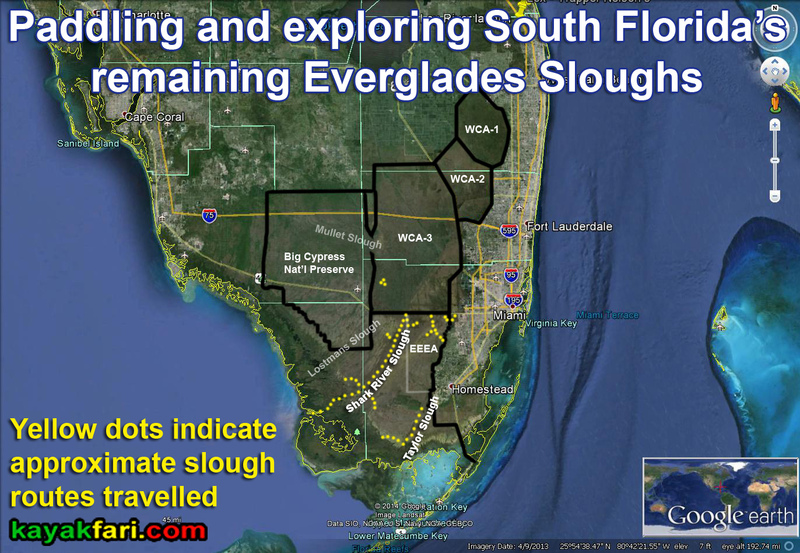 This site is an excellent resource for all Everglades trips related and we all owe them a debt of gratitude! My part was to co-lead a trip on the Bear Lake Canoe Trail along with Miami’s Esther Luft of the Virginia Key Outdoor Center (VKOC). Due to the multitudes of mosquitoes we had a small turnout, but a great time nonetheless – even if we had to paddle in bug jackets the whole time! So what happens when you get to the put-in and one of your paddlers locks himself outside of his running vehicle? 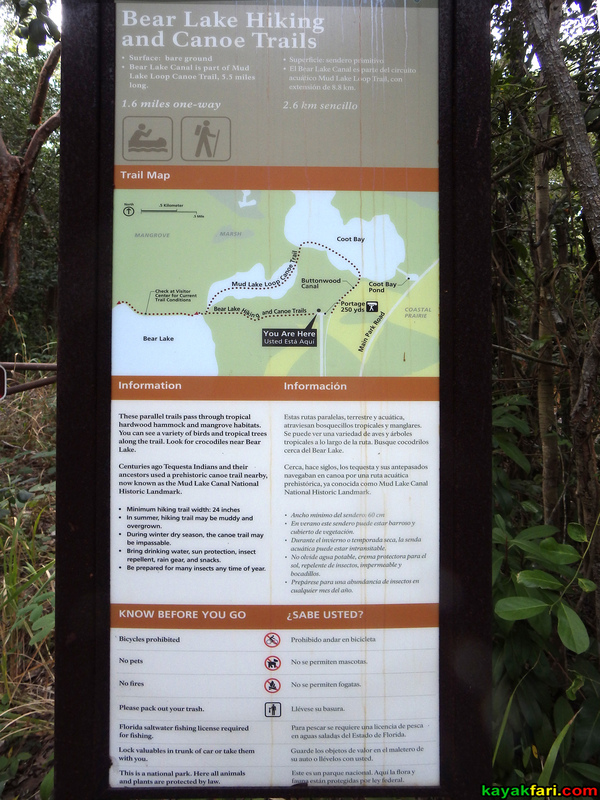 Bear Lake Canoe Trail details. Note that you can also access this put-in via a short portage from the Buttonwood Canal! CLICK for large readable version! Bear Lake Canoe Trail launch spot and old dock. Paddling on the Homestead Canal dug in the 1920’s. Paddling in bug suits, still smiling for z camera! There are always bugs, and then there are even MORE bugs! The canal is easy straight ahead paddling in chocolate color water. Unfortunately it does NOT smell like chocolate! Paddler Lisa H. enjoying the sights along the Bear Lake Canoe Trail. Esther Luft and Lisa H. paddling on the old Homestead Canal. Bear Lake though the mangrove canopy of the old Homestead Canal/Bear Lake Canoe Trail. Popping out of the mangroves and out into Bear Lake! Your 2016 Rendezvous host Charlie Arazoza of www.bushpaddlers.org paddling on Bear Lake from a previous exploratory trip. CLICK: Go West to East Cape – an interior route via “Spoonbill Pass” and Raulerson Prairie! Go West to East Cape – an interior route via “Spoonbill Pass” and Raulerson Prairie! Also see SUP paddler Scott Baste’s Mud Lake Trail adventures album (Facebook login required). Along the edge of the lake, these tiny oysters cling to the long mangrove roots like pearls! Safely zipped up back inside my bug shirt, we paddle back! The Bear Lake Canoe Trail (Homestead Canal) was cleared out for us to enjoy by the volunteer efforts of the Swamp Apes led by Tom Rahill who otherwise hunts down invasive Pythons! There are lots of pretty epiphytes like these Bromeliads all along the trail! Plants that live in the air on the Bear Lake Canoe Trail / Homestead Canal. Old dock at the Bear Lake Canoe Trail put-in on the Homestead Canal. Note that there is no parking here – it is a loading area only! Parking is slightly further back in a clearing along the Buttonwood Canal! Dock signage straight outta the 70’s! Meanwhile back in camp .. Charlie relaxes inside his bug suit and under his distinctive hat! Who is this foxy lady from the Virginia Key Outdoor Center? Esther and Kayak Ted (Spiritwalker) at camp in Flamingo. Saturday night’s dinner was truly a feast! BIG thanks to all who prepared the delicious dishes!! Bob Bonnen playing in the spotlight at the 2016 Paddlers’ Rendezvous in Flamingo. Bob also led some trips during the day! Then there comes the morning! You are looking at the skeeters OUTSIDE of the tent netting! Aerial bird’s-eye view of main camping field at Flamingo, Everglades National Park with the ill-fated Eco Tent. The 2016 Rendezvous site was similar but in the reserved lot area. CLICK for spin-around 360 view! Aerial view of the Flamingo boat launch ramps in Everglades National Park. This is where most paddlers launch out into Florida Bay! CLICK for superwide interactive panorama! Despite the easterly winds of 15-20 knots, a group of 19 paddlers assembled themselves at the Flamingo boat launch ramps for the last paddle of the 2016 Rendezvous on Florida Bay. I was very glad to have the assistance of paddler Tom Bonnen sweeping up this group of enthusiastic kayakers! Due to the stiff head wind, we hugged the mangrove shoreline heading east to have a peek out over Snake Bight. The tide was also dropping, so we didn’t have much time. Large parts of this area become exposed mud flats on low tide, especially with a strong east wind! Group heading out in the lee along the shoreline of Florida Bay. As we rounded Christian Point, we were looking out across Snake Bight into conditions similar to this. Naturally, this was the turn-around point! Hundreds of White Pelicans miles away in the distance over another flats bank in Florida Bay. CLICK for: Welcoming the fall arrival of White Pelicans in Florida Bay! Another scene of birds feeding on flats banks similar to what we saw in the distance on Snake Bight. CLICK for: The hold up at First National Bank in Florida Bay! Paddling back to Flamingo with the wind, but with only inches of water under the boats! Paddler and wood worker Tom Bonnen in his custom Black Pearl Greenland-style kayak in front of the Flamingo Ranger Station. We closed out the 2016 Florida Paddlers’ Rendezvous! BIG thanks to Charlie Arazoza, the Bush Paddlers and sponsors, the Florida Paddling Trails Association (FPTA) and all the great people that made this a success. I will look forward to the next Florida Paddlers’ Rendezvous! Happy Thanksgiving from all the Birds! Thanksgiving message of hope from the birds of the Everglades! A Heron at First National Bank in Florida Bay. Herons like to perch on top of mangrove trees in the Everglades. “Dances with Doughnuts” – flying over Florida Bay. Coming in for a landing atop a black mangrove tree. White Pelicans gathered along the shorelines of the Everglades. Sandpipers frolic along the Everglades shoreline. Roseate Spoonbills flying over First National Bank in Florida Bay. Roseate Spoonbills flying over Florida Bay. Looking for big birds up in the sky over the Everglades. Oh but wait, not so fast! More @ The Everglades are for the birds! Birding and bird portraits kayaking the Everglades, Florida Bay/Keys, Ten Thousand Islands & more! A White Heron catches an eel on the flats of Florida Bay near Little Rabbit Key. CLICK for full Gallery – The Everglades are for the birds! The tide has turned, time to start cooking!